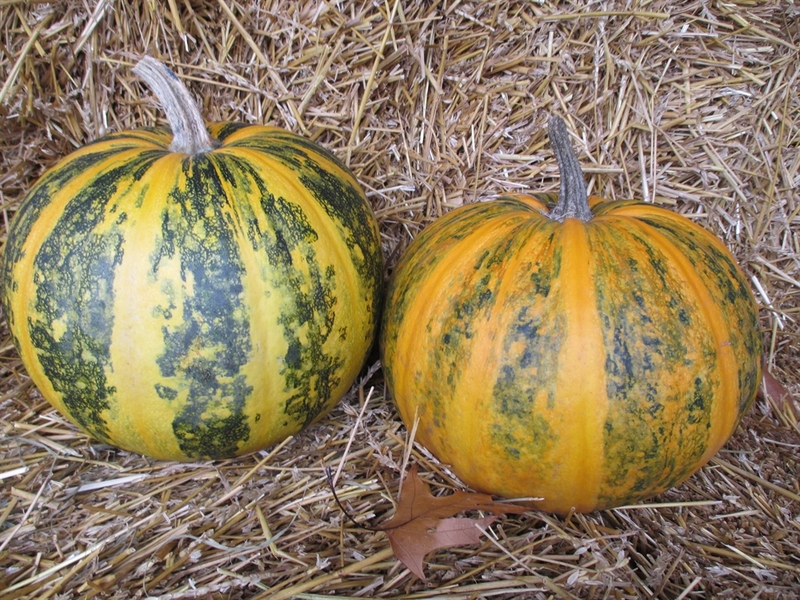 Cucurbita pepo 90 days This pumpkin was developed in the province of Styria in Austria. It is grown for its high quality hulless or “naked seeds”. Pumpkin seeds are very nutritious and a great source of protein. This pumpkin is widely adapted to growing in the North. 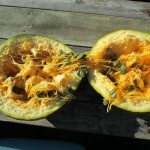 Styrian pumpkins are also raised for the oil extracted from their seeds which had medicinal as well as culinary uses. An excellent source of Vitamin A, Vitamin E, and omega 3 and omega 6 essential fatty acids. The culture is the same as regular pumpkins. You can direct seed, 1″ deep, in the garden in spring after all danger of frost has passed or you can start them indoors 4 weeks before setting out as transplants. I grow them in hills with no more than three plant to a hill. Space hills 4′-6′ apart. At maturity they will be orange with some green striping. I cut my pumpkins when the vine dies back or 2 weeks before the first expected average frost date, whichever comes first. 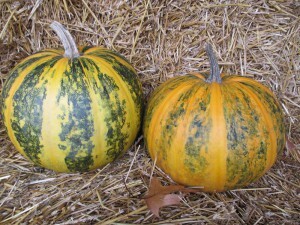 The pumpkins should be left in the field after cutting for two weeks to mature. If frost threatens they need to be brought inside to avoid damage. After curing you can harvest the seed easily. I score the pumpkin shallowly with a knife around the outside. Next I pound it on a cinder block. The pumpkin should break apart without much effort. I do this to avoid cutting too deeply through so as to avoid damaging the seeds. 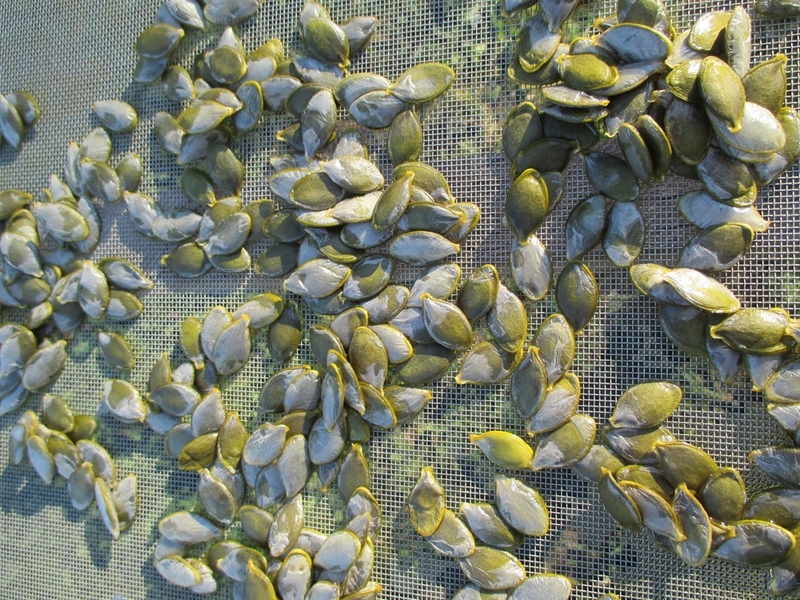 The seeds are easily removed and placed into a colander for rinsing. 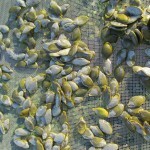 Lay out on a plastic tray or mesh screen for drying. Avoid newspaper because the seeds will stick when dry. You can store and eat the dry seeds raw, process into a butter, or roast them. They are superb roasted. I toss them with a tiny drizzle of olive oil and a pinch of salt and then spread them onto a cookie sheet and toast for 20-25 minutes at 300 degrees. 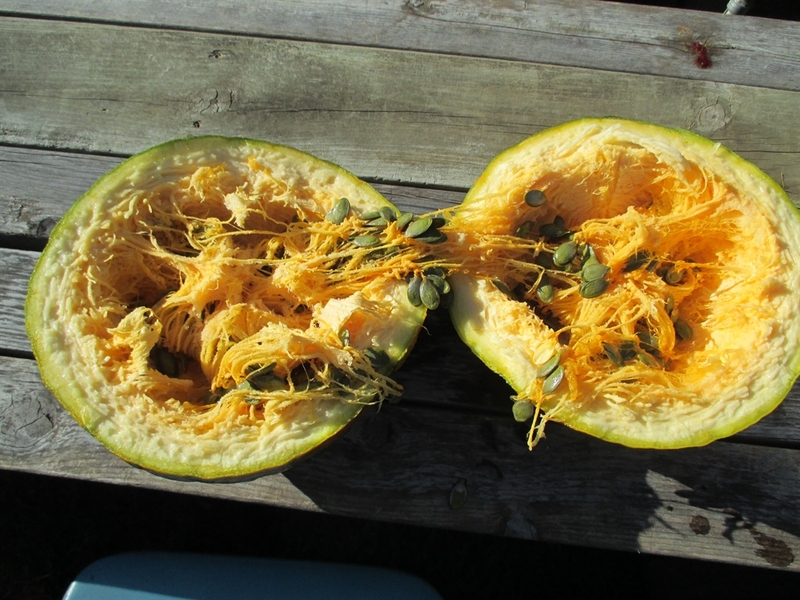 Production is moderate, as you only get about 300 seeds per pumpkin but this is offset by the excellent nutrient and protein content of the seeds. Excellent staple crop! 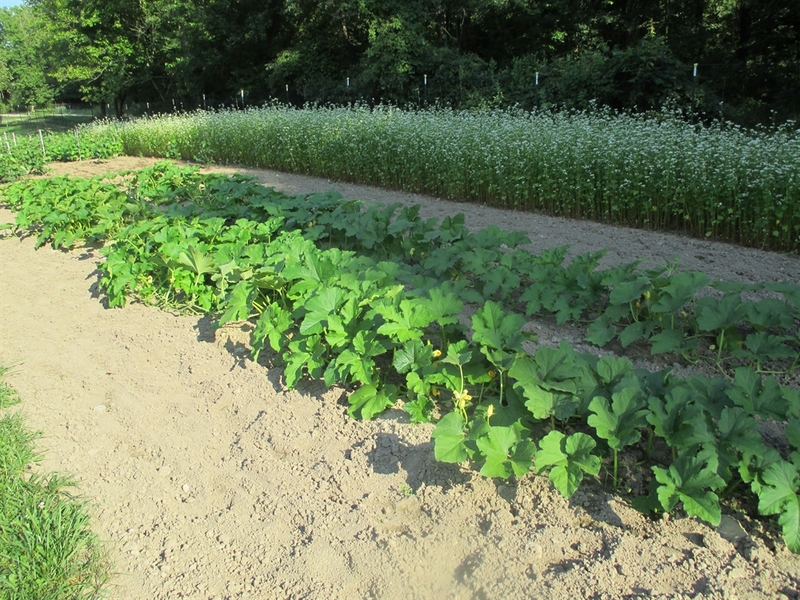 Seed Saving: Isolate from other Cucurbita pepo varieties by 1/8th mile for home use. You could also grow one from each of the four main squash species, C. pepo, C. moschata, C.maxima and C.argyrosperma (mixta). I will have seed available starting around the end of November. Can you eat the flesh of the pumpkin? Yes, the flesh is edible but very bland. Are your seeds for eating or for planting? If for consumption, then how many seeds are recommended daily? I sell for people to grow their own. You can find seed for eating online. Hello Tanya, I currently do not ship outside of the US. I should have all my seed available by Thanksgiving. Please advise when I can buy some seeds (STYRIAN) for my garden in Palm Coast, FL. I will have Styrian seed available around the end of November. Do you have a large stock of sale seeds? Should I order early or have you run out in the past? It all depends. Some items like rice, corn and some beans I have plenty. Others are limited. I should have the website ready to take orders some time this coming weekend (Nov 18th). Seeds are often sourced by organic vegetable farmers between Canada and America. I was a caregiver to an Austrian great grandmother who farmed until she was no longer able, she taught me about these special pumpkin and had a farmer mail some oil to her until her passing this year. I would love to grow them on our small acreage in memory of her. What is the reason for why you only mail within the U.S.? I would gladly purchase two orders for here in Quebec. Thank you kindly for what you do, beautiful work. Hello Sarah, The primary reason I do not sell outside of the US is because of the size of my business. I have a very small farm and I am the sole employee. I simply do not currently have an adequate supply of seed to sell outside the US. Maybe someday. 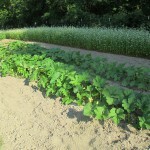 What is the average number of squash each plant produces? I usually get 3 – 4 large pumpkins per plant.